Entrepreneurship is all about being brave and visionary. When an entrepreneur starts his journey, he is never sure about the exact outcome. All that he knows is that he has an idea and the world needs that idea. When Twitter, a microblogging site was launched in July, 2006, it was competing against some of the biggest social networking sites in the world, having millions of dedicated users. Critics said that 140 characters are not enough to express a particular view about a particular topic. People laughed when they heard about Tweets and Followers. Who will tweet? They asked. Today, there are 2000 employees working for Twitter, spread over 15 countries. 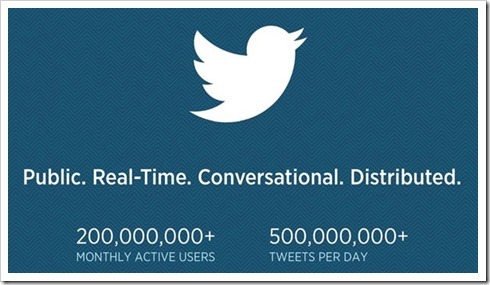 It has more than 200 million users and 500 million Tweets are being send in a day! Yesterday when Twitter revealed its data for a prospective $1 billion IPO, the world had to notice it. Wrapped in an 800 pages IPO filing document, Twitter for the first time in its history revealed some of the most astonishing data about microblogging and its usage. 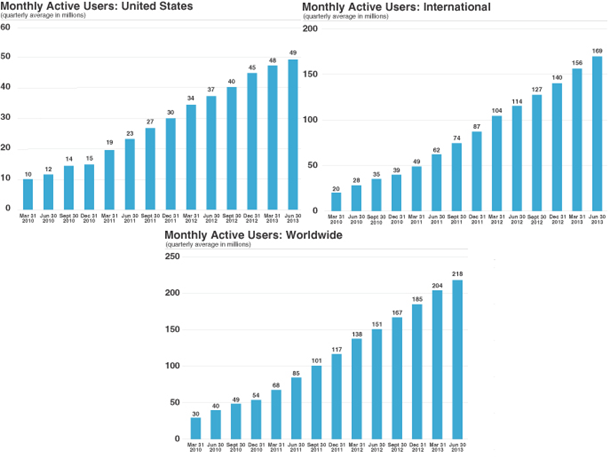 As of June 30, there are 218.3 million Twitter users from all over the world. This is 44% more than June 30, 2012. In comparison, Linkedin has 240 million users and Facebook has 1.2 billion users. 1) At any given time, 100 million users are active on Twitter, who collectively send 500 million Tweets/ day; which means on an average, one Twitter user sends 5 Tweets in a day. If everyone consumes full quota of 140 characters, then this will convert to 70 billion characters of messages, in 24 hours. 2) 218.3 million Twitter users generate around 1.65 billion pageviews of the Twitter timeline, which converts to about 16 pageviews, per user per day. Mobile contributes 70% of Twitter’s user base. 3) In the year 2012, Twitter’s revenue increased by 198% to reach $316 million. 4) Average revenue per user for Twitter, the most important metrics to judge a social network, is 64 cents. For Facebook, it is $1.6. 5) Although its revenues are increasing, the net profit generated by Twitter is zero. In the year 2012, it had losses of $128 million. But compared to 2011, its almost 50% less. 6) Twitter makes most of its income from advertising. As per the IPO papers, 87% of its revenues are generated by advertising, which is a factor which worries share holder. 67% of those are generated by mobile ads. 7) Twitter makes 30 cents per 1000 pageviews, which translates to revenues of $495,000 per day. 8) By the time IPO would be launched, there would be enough buzz in the market to propel Twitter’s valuation between $10 billion to $20 billion. After the famed Facebook IPO last year, it would be the biggest IPO coming in from a technology company in USA. These numbers and stats reveal just one thing: Nothing is impossible. People acknowledge and appreciate innovative ideas and if you are honest, people will reciprocate. This amazing success story within 7 years of its existence is nothing short of a miracle. Internet Freedom In India…Going Bad To Worse!